Holds up to an amazing 16 quarts! 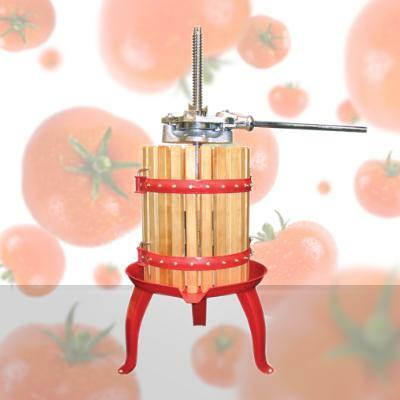 Tomato Milling.com is proud to offer the Weston Fruit and Wine Press. This machine is perfect for home usage! Make your favorite juices easily and virtually mess-free. It is great for get-togethers and parties, and everyone is sure to love the old-fashioned design of the Fruit and Wine Press! Ratchet mechanism provides leverage and power to extract the maximum amount of juice. Powder-coated cast iron construction will resist rust and contamination. Hardwood cage construction will provide you with years of maintenance free service. 1. Place fruit of choice into juicing cage. 2. Place wood pressing blocks on top of the fruit and ratchet the handle down. 3. The juice will be squeezed out of the fruit and will exit the juice cage through the opening in the slats, then down to a built-in spout. 4. The molded bottom tray will funnel the juice into your container. Weston Brand was established in 1997 under the parent company of Pragotrade USA, Inc. Our brands are among the best known and respected in the industry. The Weston Supply brand offers products and tools that will assist you with meat processing, fishing, hunting and baking. Remove the ratchet mechanism from the screw. Remove the pins from the cage and separate the 1/2 cages. Clean the cages in hot soapy water. Using a long bristle brush, be sure the spaces between the boards of the cage are clean. Wash the base, screw, and semi-discs in hot soapy water. Wash the rathet mechanism if necessary. Reassemble the cages onto the base. Drop the semi-discs and the blocks into the cage. Weston Fruit and Apple Crusher: Easily crush your tomatoes and vegetables as well as harder fruits such as apples and pears! Weston Fruit and Apple Hopper: Load your fruit quickly and easily.